Top-up your phone online with a basic top-up with low rates that don't expire. Or convert your credit into a great value PAYG (Pay As You Go) add-on which offers a bundle of minutes, texts and data that last for 30 days. Top-up online can be done with a debit or credit card, or using a voucher. All minutes, text and data add-ons can be used in 71 destinations at no extra cost with Go Roam. However, when roaming abroad there is a fair usage policy of 12GB data per month. In Go Roam in Europe destinations usage beyond 12GB will incur a surcharge, while usage above 12GB isn't possible in a Go Roam around the World destination. Top-up your mobile broadband dongle, MiFi device or tablet online with a basic top-up and pay for the data you use. 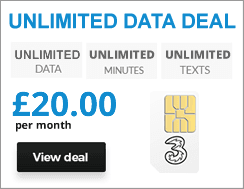 Or choose a great value PAYG add-on with a bundle of data that lasts for 30 days. Top-up online can be done with a debit or credit card, or using a voucher. When you buy an mobile broadband add-on you also benefit from Go Roam around the world enabling your data to be used in 71 countries. Can I top-up on the phone? Yes, simply call 444 from your Three phone and follow the instructions. Can I top-up with a voucher? Yes, you can buy a voucher from a high-street store and then activate it by dialing 444 on your Three phone. Are there any other ways to top-up? Yes, there are a number of alternatives for topping-up on Three. My3 Account - Login to your My3 Account to top-up using a voucher or debit/credit card. Cash Machine - Top-Up at Barclays or HSBC cash machines if you have a card from Barclays, HSBC, Nationwide, The Coventry, Yorkshire or Clydesdale. How do I find my Three phone number? Add-ons are an enhanced version of Pay As You Go designed to offer better value for your money. Instead of simply using your credit to pay for usage you get a bundle of minutes, texts and data to use within 30 days. If you're buying an add-on you'll first have to top-up and will then be able to convert your credit into an add-on. Can I have more than one add-on active? Yes. Add-ons can be combined where applicable. For example, you might have both a Three-to-Three add-on (giving you 3000 Three-to-Three minutes) and an All In One 10 add-on (giving you 1GB of data, 3000 minutes and 3000 texts). In this case your Three-to-Three minutes would be used when calling someone else on Three, while your other allowances would be used the rest of the time. Will an add-on be used before any credit? Yes, if you have both an add-on and some ordinary credit the allowances from the add-on will be used first. Add-ons don’t cover you making an international call, using your allowances abroad outside of Feel At Home locations, using a text message shortcode service or calling a special number. What happens when I use up my add-on? If you have a second add-on queued then this will be activated automatically. If not, Three will send you a text when you’ve used up 80% of your add-on and another when you’ve used it up completely, so you’ll know you need to buy another or top up. Yes, although Three recommends doing so before you leave if possible. If you do need to top-up when abroad you’ll need to use a debit or credit card, as you won’t be able to buy a voucher. And remember, add-ons only work in Feel At Home locations. Trouble topping up? If you’re using a credit or debit card make sure it’s registered at the same address as you’re registered at Three with, that it hasn’t expired and that you’ve entered the security code correctly. Also, be sure you’ve got at least £10 in your account. Issues with vouchers? Double check you’ve entered the correct voucher number and if all else fails turn your device off and on again. No credit in your account? If you’ve topped up but can’t see the credit, wait an hour just in case there’s a delay. Or try turning your device off and on again. Still no luck? If none of the above has helped you can always give Three a call on 333 from your Three phone for assistance. The information contained on this website has been written to assist our readers. We do not represent Three or speak on its behalf and are entirely independent of Three.